A few weeks ago we made a trip to Washington D.C. to visit with Politicians on a Tuesday. Thursday we set out to see Arlington National Cemetery. One of the couples with us had never seen the changing of the guard at the tomb of the unknown soldier. We had a short time frame to be there because of a meeting that we had that afternoon. Disappointment set in when it was found out that we would miss the changing of the guard. As we made our way up to the tomb of the Unknown Soldier we heard a canon discharge. A Turkish dignitary had come and laid a reef at the tomb with a canon salute and they had a special changing of the guard. As the Turkish dignitary drove off in a black SUV in a motorcade, we noticed some of the Officers of the Old Guard that were still standing around. 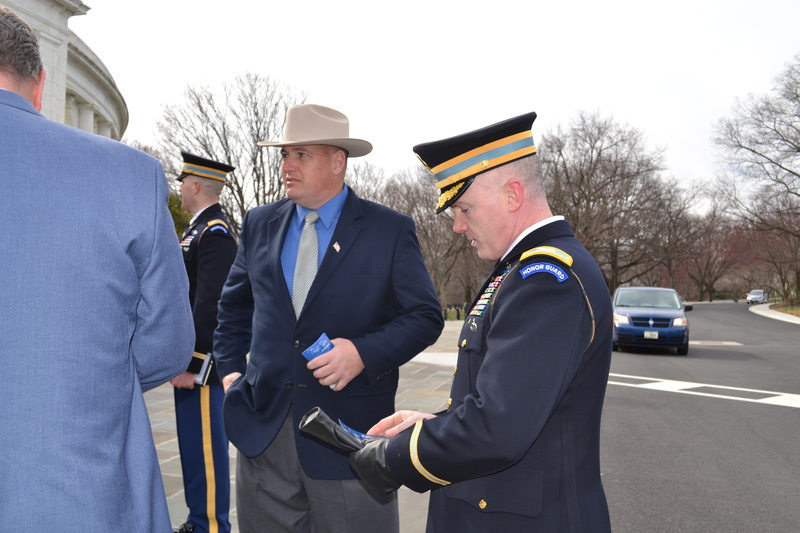 I began passing out our Badges & Boots tracts and began to witness to these men. The Colonel pictured below took my information and said he would pass it along to his unit Chaplain. I made some contacts for Badges & Boots Worldwide and the one couple got to see the changing of the guard. That is a wonderful blessing!